2015 is the fourth vintage of the Throne blend, which is comprised of 53% Grenache, 35% Syrah and 12% Mourvedre. This wine is inspired by Guy’s time working harvest in the Rhone Valley. The connections he made while learning there were integral in sculpting his winemaking journey and he wanted to craft a wine that reflects the spirit and energy of this special place. 2015 was an ideal growing season in the Russian River Valley and the quality of the fruit coming off of these cool vineyard sites was stunning. Our Estate Syrah and the Mourvedre add a richness of darker fruit, earthiness and spice to compliment the red fruit of the Grenache from Saralee’s Vineyard, allowing us to achieve what we like to call our “Super Cote du Rhone”. All three varietals are picked, sorted, fermented and barrel aged separately in 100% French oak. Through multiple blending trials, varying the percentage of each varitel slightly, Guy is able to craft a beautifully balanced blend. 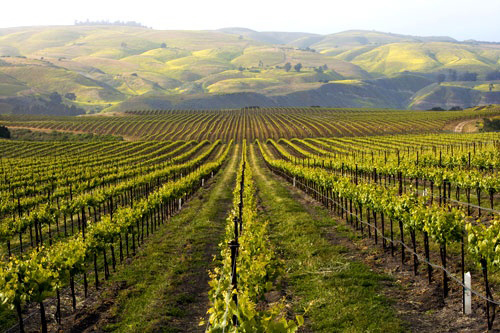 Inspired by the traditions of the Rhone Valley, it showcases the terroir of the Russian River Valley beautifully. The objective in crafting this wine is to not only have the ultimate in complexity and balance - but a combination of richness and respect to the traditions of these grapes, which is the best of both new and old worlds.